With our experience in the industry, we know that sewer line failures can occur and may go unnoticed until it is too late. Sewer line failures are expensive, inconvenient, and heartbreaking. Adequate drainage of plumbing fixtures is evaluated during a home inspection, however, lived-in conditions can not be fully simulated. Without inserting a sewer scope camera into the home's underground waste lines, the true condition may not be discovered. 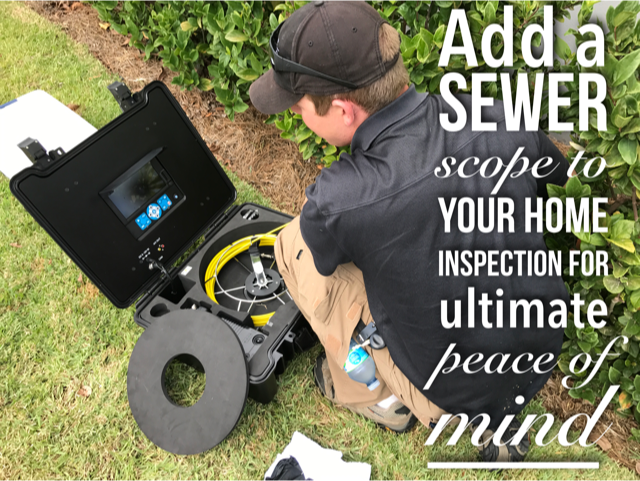 ​A sewer scope inspection is recommended for houses of all ages, pipes of all materials, and both city sewer and septic systems. Repairs to the property's underground waste line can be thousands of dollars. If the property experiences a sewage backup, costs can skyrocket and oftentimes are not coverage by homeowner's insurance. In addition to the camera inspection, we can locate and mark where pipe damage is in a line so that a repair company can quickly and easily repair the pipe without major intrusions. Sewer Scope Inspection in Clermont FL, Minneola, Groveland, Mascotte and surrounding areas of Lake County. Sewer Scope Inspection in Winter Garden FL, Ocoee, Apopka, Mount Dora, Eustis, Travares and surrounding areas. Sewer Scope Inspection in Orlando Florida, Windermere, Winter Park, Dr Phillips, Maitland, and surrounding areas.